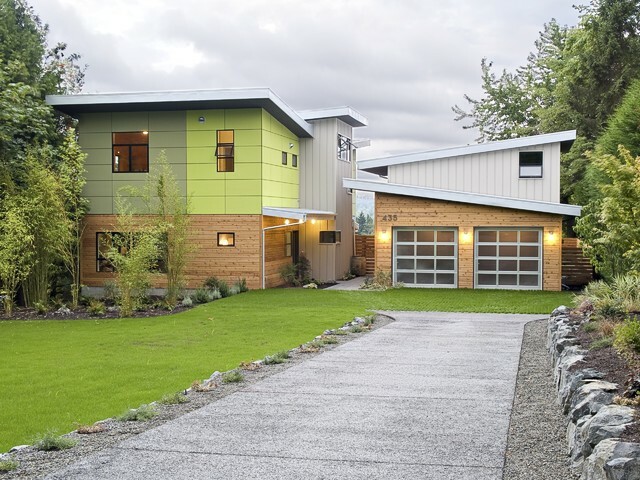 One of the biggest problems with the single-family home is the garage: its design (apparently an afterthought in many cases), its size, and its placement. The norm, an attached multi-car garage often closer to the street than the front door, needs improvement. 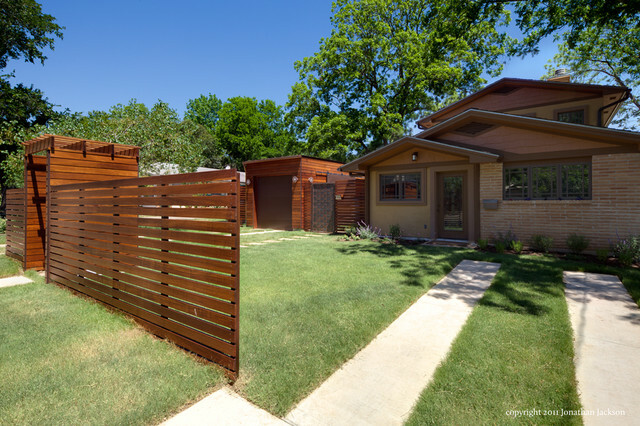 This blog post takes a broad look at garages, garage doors and driveways to see how the storage of cars can be better integrated into the design of houses. A four-car garage is unwieldy whatever the circumstances may be, but the architects on this project created four distinct doors, instead of two bigger ones. 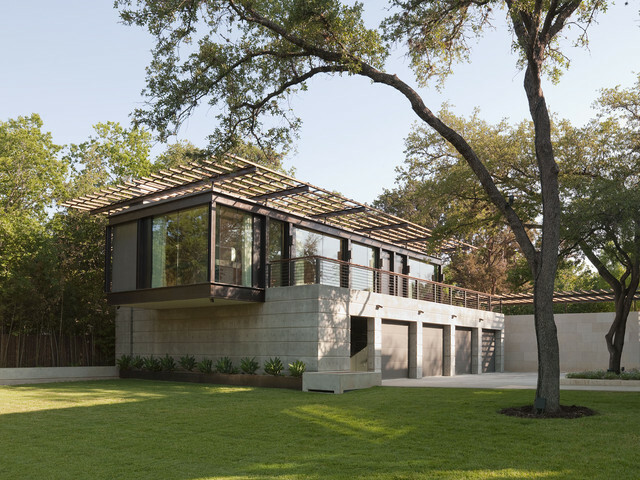 Above is a cantilevered glass volume that utilizes the roof above the garage for a terrace. 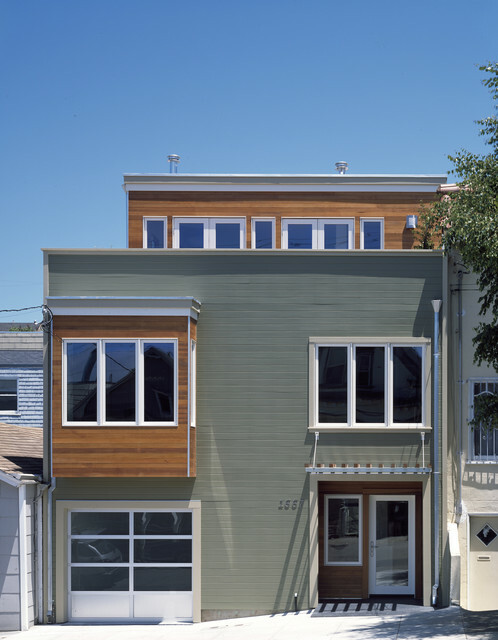 This contemporary house — two boxes with large irregular glass openings — incorporates the garage by continuing the irregular nature of the windows above. The garage is tight to the corner, showing the depth of the exterior wall in the process. It’s a unique design, but one can learn from it how the garage can be integrated with the house, both physically and in terms of style. The next batch of examples are what I call the “village approach.” Both the house and garage are composed of smaller volumes, sometimes literally but in most cases formally through the articulation of roofs and exterior walls. 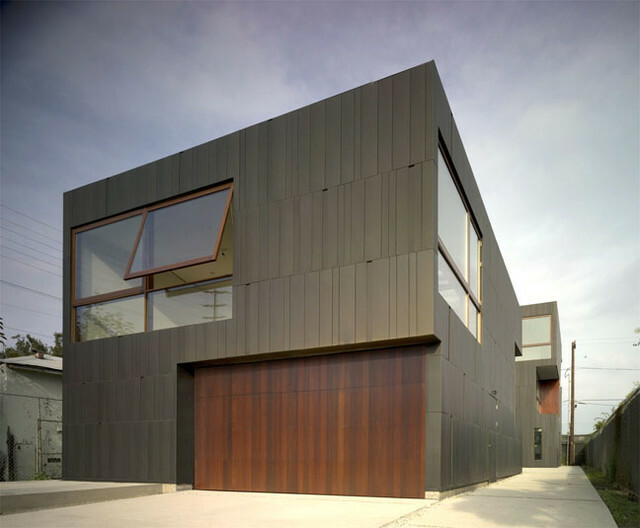 In this example the garage, covered in wood with a translucent garage door, fronts a house that is highly articulated modern composition. 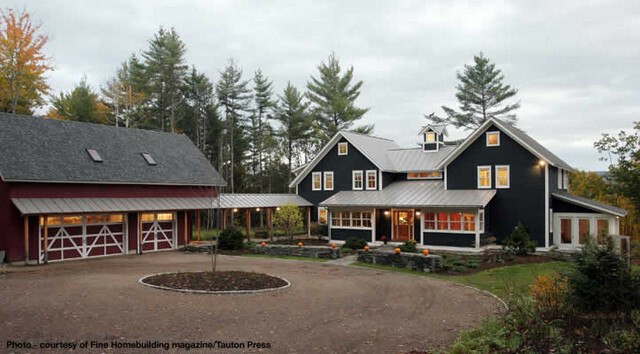 The garage (left) and farmhouse (right) are linked by a covered walkway that is echoed in the design of the house. A new garage can be found to the left of this house. A closer look beyond the gate between the two volumes reveals a quaint walkway linking the garage and house. A sliding metal door provides access to and from the garage, an interesting touch. But let’s not forget city dwellings, where a village approach is quite difficult. Small lots require other solutions, such as this ground-floor garage that has a similar appearance to the windows above. At the very least the way the windows are stacked above the garage and entry give the facade a logic, even though each pieces is detailed differently. The zone in front of the garage is just as important as, say, the garage door or where the garage is located relative to the house. An increasingly popular approach is to use a drivable grass surface, be it a product that is hidden beneath the blades or incorporating grass between pavers. Grass paving allows water that would normally run into the street and sewer to enter the ground and be naturally filtered. Here grass is found next to the garage, at the bottom of a more traditional driveway. The pattern in this lawn points to how it is a hybrid surface that can be driven upon. 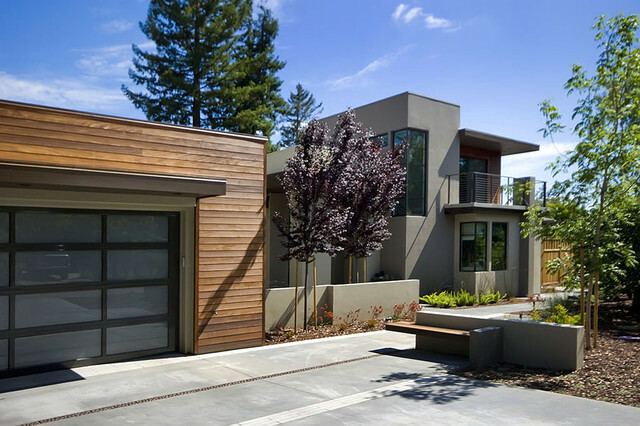 How would you integrate your garage and garage door with your home’s design? Do you have a favorite out of these eight garages? Let us know in the comments below! This entry was posted in Home Design and tagged Amarr, amarr garage doors, building products, Entrematic, exterior design, garage, garage doors, home design, home exterior, overhead doors, sectional doors. Bookmark the permalink.